Alistair Petrie stars in DEEP STATE as “George White,” English, 50’s, an old-school MI6 and chief of the British part of The Section. White is more of a political animal than a field operative, he’s got a chess player’s mind and is a man used to reading shadows and silences. White is ambitious and entrepreneurial but he knows his world has been corrupted beyond repair. White lives with his wife and two children Harper (8) and Rex (6). 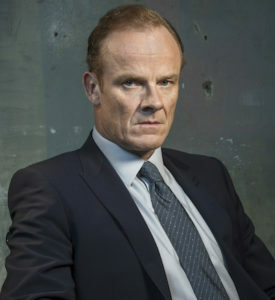 In 2016 Alistair Petrie starred alongside Tom Hiddleston and Hugh Laurie in the global hit The Night Manager for BBC/AMC, as well as Rogue One: A Star Wars Story. Having previously worked with Ron Howard on Rush, they worked together again on National Geographic’s Genius. Other films include Cloud Atlas, The Bank Job and The Duchess. Previous television credits includes the BAFTA-winning The Mark of Cain, Cranford, Sherlock and Utopia. Alistair previously worked with Mark Strong in Emma alongside a cast including Kate Beckinsale, Samantha Morton and Olivia Williams.